Boost productivity and support an efficient workspace with this docking station. 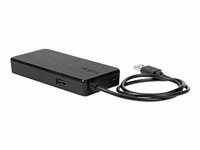 Designed to support multiple laptop operating systems and brands this dock offers a simple and fast connection to dual screens, the Internet and external peripherals. Its compact size makes it ideal for the home office or environments where a clean desk policy exists.